FILE- A Malaysian pangolin walks past cages containing 45 others as a wildlife officer watches in Kuala Lumpur, Aug. 8, 2002. You may be surprised to learn that the world’s most trafficked endangered mammal is a strange-looking animal. It is the pangolin, also known as the scaly anteater. An adult pangolin can be almost 100 centimeters in length, although the smallest are only about 30 centimeters long. The animal’s body is covered in small, thin scales that help to protect the animal from attack. Pangolins can fight off attackers with their sharp claws. Yet they possess little defense against human attackers. Several years ago, demand for the meat and scales of pangolins was rising in China. It got so high that all eight kinds of pangolin were declared vulnerable or critically endangered. The International Union For Conservation of Nature, or IUCN, is an organization working to protect wild animals and their environment. It claims that pangolins represent as much as 20 percent of all illegal wildlife trade. The IUCN reports that more than a million pangolins were illegally hunted in the 10 years leading up to 2014. Environmental activists and nongovernmental organizations have worked hard to learn all they can about pangolins. An IUCN Species Survival Commission formed a pangolin specialist group in 2012. One hundred experts from 25 countries are a part of the group. Commission members organized a pangolin awareness day each year in February, starting in 2014. It is called World Pangolin Day. Pangolins can be found in parts of Asia, including China, India, Indonesia, Myanmar, Thailand and Vietnam. In Africa, Uganda appears to be a leading supplier of pangolins. Radio Free Asia reports the pangolin trade is highly profitable. Traders can purchase the animals at low prices in Uganda, for example, and then sell them at high prices in Asia. Experts say that most of the illegally bought and sold pangolins are shipped either to China or to Vietnam. In both countries, the animals’ scales are said to be prized for medicinal value. At least one media report noted that some people have worn pangolin scales like jewelry. In addition, pangolin meat is considered a rare, very costly food. In Vietnam, some restaurants serve the meat as their most costly meal. In 2016, an international agency governing wildlife trading worldwide banned illegal hunting, trafficking and sale of pangolins. All 182 member nations of the Convention on International Trade in Endangered Species voted to support the ban. FILE - Bags of pangolin scales are pictured next to elephant tusks seized from traffickers by Ivorian wildlife agents, Abidjan, Ivory Coast, Jan. 25, 2018. China’s government has been increasing its efforts to fight the pangolin trade. And on January 1, Vietnam amended its laws to increase prison sentences for illegal wildlife sales. The longest sentence is now 15 years, up from seven years. 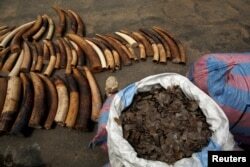 But when it comes to the illegal trade of pangolins and rhinoceros horns, Vietnam has been slow to act on its promises. The same has been true of its willingness to enforce the strongest sentences. In 2014, CNN television reported that Vietnam had only a limited ability to deal with rescued pangolins. Activists working to halt the trade and care for captured pangolins had little support, the report said. Hong Kong has also been slow in enacting punishment. There is no scientific evidence to support the belief that pangolin scales have medical uses. Still, many citizens in Hong Kong apparently believe they do. Pangolins’ thick protective scales are made from keratin, the same material that makes up human fingernails. Users heat the animal’s skin in water to remove the scales, then dry and cook them. On March 22, the French news agency Agence France Presse reported that some Hong Kong businesses were still involved in the trade. They were selling pangolins scales, sometimes hidden behind boxes containing other goods. One salesman selling the scales for $108 for only 40 grams claimed that the scales could remove toxic substances. The scales can cost more than $3,000 for just one kilogram. The illegal trade in pangolins is reported to be widespread in Indonesia. Between 2007 and 2015, Indonesian officials seized 31,000 pangolins. Separately, in Malaysia, Thailand, and Uganda, some 21,000 pangolins were reported to have been collected during the same period. Indonesia has declared bans on the hunting and trading of the endangered animals, while threatening severe punishment for violators. But enforcement is a problem, with a lack of money going to control the trade. 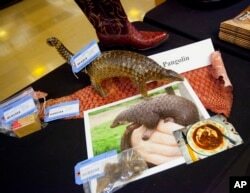 Items made from pangolins are displayed during a press preview of confiscated wildlife contraband at the State Department in Washington during the U.S.-China Strategic and Economic Dialogue, June 24, 2015. Endangered pangolins have gained much less international attention than elephants and rhinoceroses. Some experts say these larger animals possess a kind of special appeal lacking in the smaller anteaters. Pangolins are only active at night, making them difficult to observe in the wild. In captivity, pangolins easily fall victim to disease and depression, so they are rarely to be found with other animals in zoos. An exception can be seen in Taiwan, where they have been treated as stars of the animal world. They are taken to zoos, brought back to good health when injured, and returned to the wild when possible. Dan Southerland first reported this story for Radio Free Asia. Pete Musto adapted his report for VOA Learning English. George Grow was the editor. We want to hear from you. What more can countries do to stop the illegal trade of pangolins? Write to us in the Comments Section or on our Facebook page.